2013 Skoda Octavia vRS diesel review | What Car? Fast, fun, practical and cheap to run; if anything can live up to this 'all things to all drivers' claim, it's the 2013 Skoda Octavia vRS diesel. Its 181bhp diesel engine gives a 0-62mph time of 8.1 seconds, yet it can still average an official average of 61.4mpg. Better still, it's available in both hatchback and estate body shapes, and it undercuts the rival VW Golf GTD 5dr by a sizeable 2680. Here, we're testing the hatchback version with the standard six-speed manual gearbox (a six-speed auto is available as an option). 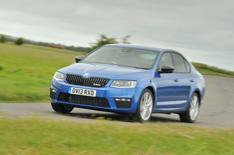 What's the 2013 Skoda Octavia vRS diesel like to drive? The diesel vRS certainly gets the 'fun' bit right. The steering is quicker than in more humdrum Octavias, so you need to apply less lock to prompt the nose of the car to tuck itself into bends. Even with the Driving Mode Selector set to Normal the steering weights up consistently as you turn in; switch to Sport and it becomes heavier to provide extra reassurance. Attack a corner and there's a slight delay between the front of the car reacting and the rear following suit, although for such a big car with a hefty rear overhang, body movement is pretty well controlled. There's plenty of grip, too, with the front wheels running wide of your intended line only when you're cornering close to the car's limits. The 181bhp 2.0-litre diesel engine is more of a mixed bag. It's properly strong through the mid-range, giving the vRS crushing overtaking ability even in the high gears. This impressive flexibility makes the Octavia feel even faster than its 0-62mph time suggests. However, while the engine might be efficient, it's also rather noisy. Push the revs beyond 3000rpm, and you're treated to a lot of diesel clatter that isn't at all sporty in tone. Road noise adds to the din especially over coarse surfaces. Then there's the ride. The vRS has more a more sophisticated rear suspension set-up than other Octavias, but due to stiffer shock absorbers and a lower ride height (plus the optional 18-inch alloys fitted to our test car), you're tossed around a lot more on bumpy roads. It's never horrendously firm or crashy, but considering this is a supposed to be a hot hatch that offers a mixed variety of talents, we're surprised it isn't a bit more supple. What's the 2013 Skoda Octavia vRS diesel like inside? Skoda's vRS models have always been a lesson in understatement, so it's no surprise the cabin in this new version isn't much different from the regular Octavia's. There's a sportier-looking steering wheel, a smattering of discreet vRS badges and some figure-hugging seats, but otherwise you may as well be sitting in an entry-level 1.2 TSI. Still, that's no bad thing, because it means you get the same great driving position, easy-to-use dashboard and classy materials that are a match for those in the latest VW Golf. Over-the-shoulder vision isn't as good as it is in the VW because of the Octavia's sloping rear screen and notchback styling, but the trade-off is loads more rear legroom and an enormous 590-litre boot bigger even than a Ford Mondeo's. The vRS also comes with loads of standard kit, including 17-inch alloys, climate control, xenon headlights, LED running lights, city emergency braking, lane-keep assist and a 5.8-inch colour touch-screen infotainment system. At first glance, the Octavia vRS diesel seems to have plenty going for it. It's much cheaper to buy than a Golf GTD, plus it's more practical and almost as classy inside. However, while the Golf does the hot hatch bit just as well as the Skoda, it's effortlessly easy to live with the rest of the time, thanks to its excellent refinement and relatively supple ride. The Skoda falls down on both of these scores. The Octavia is also let down by its CO2 emissions, because while 119g/km is unlikely to upset any green lobbyists, both the Golf and Leon 2.0 TDI 184 FR emit 109g/km, so they qualify for a lower company car tax band. The Leon appeals on other counts, too: it undercuts the Octavia by 900, it's faster and it's slightly sharper to drive. In the end, then, the Skoda's size is its biggest selling point.